A Better Way to Evaluate Powerplay Success - The Point Data-driven hockey storytelling that gets right to the point. Since the NHL started tracking powerplay success rates over 40 years ago – not much has changed in terms of how we evaluate this area of special teams. How often a team scores relative to the opportunities they have. That’s it. What that tells us, for instance, is that last year the Dallas Stars had a below average powerplay, 19th overall. It does not tell us that the Stars had one of the most effective 5-man units in the league. Or that the 5-man unit that scored the most powerplay goals, a group led by Alex Ovechkin in Washington, was a lot closer to average than elite – during the regular season, anyway. In looking at how individual powerplay units perform, we can gain a better understanding of which teams are deploying the most optimal selection of players and which powerplays are in need of an overhaul. Sixteen, 5-man units played at least 75 minutes together at 5v4 last season – they are listed here along with their total ice-time and goals scored per-20 minutes. The Mitch Marner-led group in Toronto was the most productive of the bunch, scoring 4.5 goals per-20. Marner drove play from the right wall on this unit; directly involved in 23 of the 27 goals they scored. What’s interesting to note is that two players on this unit are no longer members of the Maple Leafs. 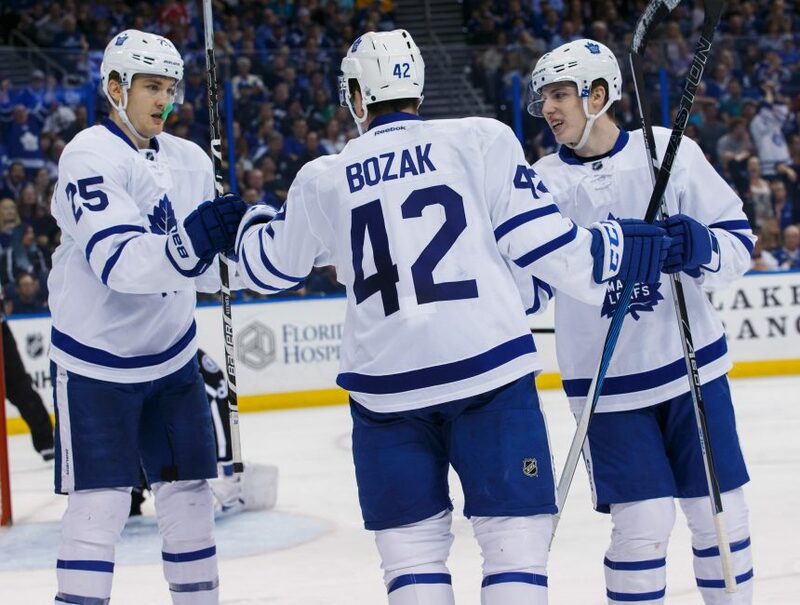 Tyler Bozak and James Van Riemsdyk both left via free agency and even though Toronto signed John Tavares, this leaves questions as to whether the Leafs can replicate the powerplay success they had last season. JVR scored 10 of the 27 goals on the top unit and was a popular down-low option for the playmaking Marner. 20 of the 27 goals scored by this unit came from the inner slot – an area JVR produces from better than almost anyone in the league. The Leafs still have plenty of firepower at their disposal but whether they can reproduce the same type of chemistry and production at 5v4 remains to be seen. The aforementioned top unit in Dallas, featuring John Klingberg, Tyler Seguin, Jamie Benn, Alex Radulov, and Devin Shore was the second most productive unit, scoring an average of 4.1 goals per-20. In the situations where Shore was replaced by Jason Spezza or Brett Ritchie, the Stars saw a noticeable decline in production, which brought their overall powerplay success rate down. As mentioned, the Capitals unit of John Carlson, Alex Ovechkin, Nicklas Backstrom, T.J. Oshie, and Evgeni Kuznetsov wasn’t as effective as most people might think. This group played, by far, the most minutes together at 5v4 – over 200 – and scored more than anyone – 34 goals. However, on a per-20 minute basis, they averaged 3.2 goals which was the average output of these most used units. That said, this group was well above average in the playoffs scoring 16 times and averaging over 5 goals per-20 – a monster number. Of the most used five-man units in the league last season, the Blues top unit of Alex Pietrangelo, Brayden Schenn, Jayden Schwartz, Alex Steen and Vladimir Tarasenko struggled the most. This group managed just 6 goals in 80+ minutes for a per-20 rate of 1.5 goals – less than half the average production of the most used units in the NHL. Schenn didn’t score once with this group, which is pretty wild considering he led the NHL in powerplay goals the year before with the Flyers. 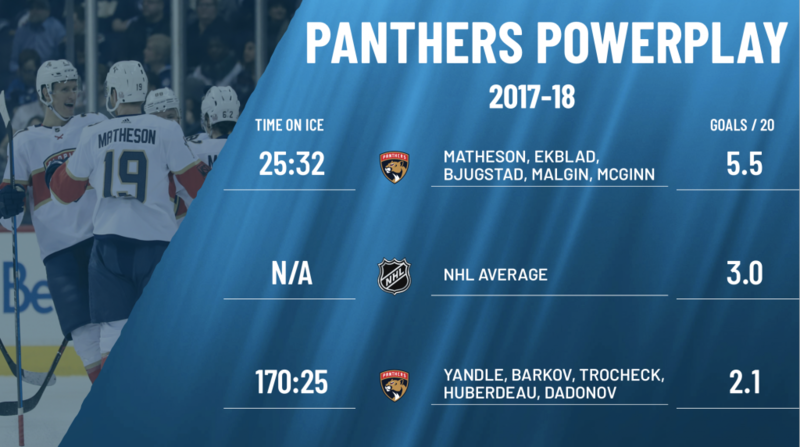 The group at the top of the list, somewhat surprisingly, is a second unit that the Panthers put together midway through the season consisting of Mike Matheson, Aaron Ekblad, Dennis Malgin, Nick Bjugstad, and Jamie McGinn. This group scored 7 goals in just over 25 minutes together and used a set play to generate almost all of its production. Matheson would slide from the right side of the ice to the middle, which opened up space for Malgin on the right wall. A right shot, Malgin had time to put pucks on net to either score or create an odd-man rebound situation down low. This led to a majority of their goals. The other option, which they tried several times and scored on twice, was Malgin shooting intentionally? wide – banking the puck off the boards behind the net and right to a pinching Ekblad at the far side post. Despite its limited time together, this group was incredibly effective – much more so than Florida’s number 1 unit. An aberration or perhaps something the Panthers will look at in terms of balancing out powerplay time? We’ll find out this season. 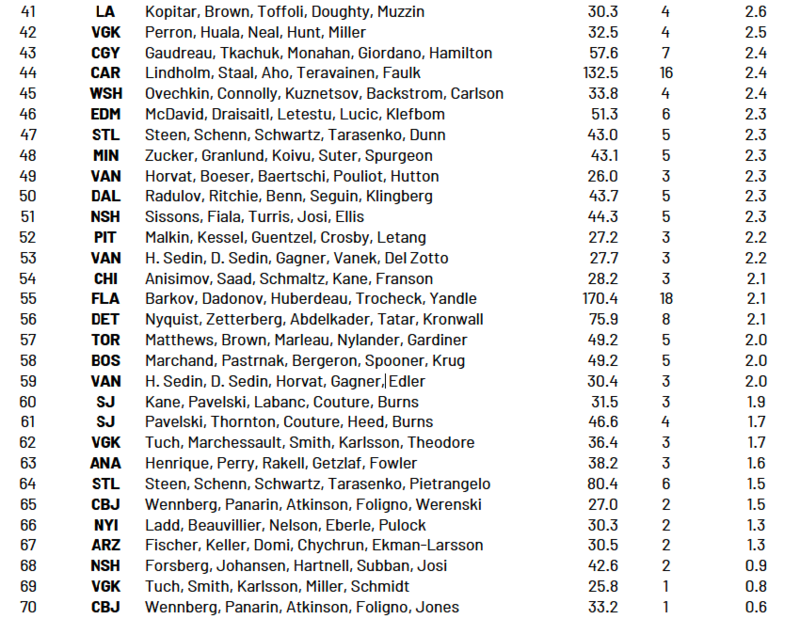 The unit of Alex Wennberg, Artemi Panarin, Cam Atkinson, Pierre-Luc Dubois, and Seth Jones was the second most productive in the NHL, of groups that played at least 25 minutes together. 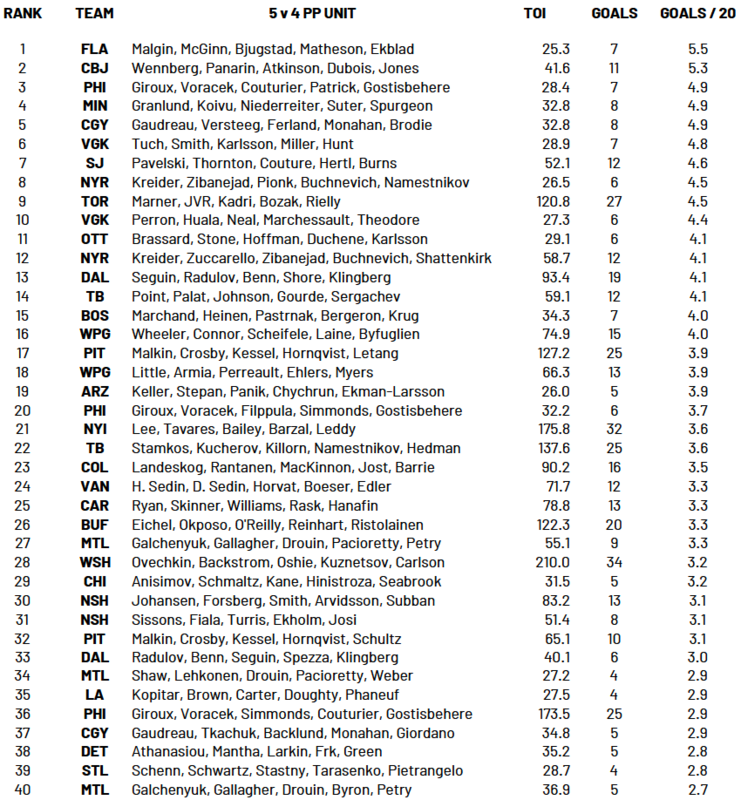 Replace Dubois with Nick Foligno and the unit dropped to 70th – dead last. Interesting, right? Both units played similar minutes together and both players played the same role – net-front, screen the goalie, grab rebounds. Dubois wasn’t involved in most of the powerplay goals scored by the unit while he was on it but did outperform Foligno in most individual powerplay metrics so while this might be an anomaly, it’s something to watch this season. Nolan Patrick spent some time with the big boys in Philadelphia starting in January and he absolutely crushed it. Patrick filled Wayne Simmonds role on the top unit with Claude Giroux, Jakub Voracek, Sean Couturier, and Shane Gostisbehere and in just under 30 minutes together this group scored 7 times – good for the 3rd best per-20 rate in the league. Patrick was involved in all of them, scoring 5 times and picking up a beauty assist with a behind-the-back pass. With JVR in the mix this year, Philly will have plenty of options to set up a couple of units with dangerous weapons on both. And finally, the unit that spent the most time together without scoring a goal…….a unit with 3 of the top 100 players in NHL history (as voted by the NHL during its Centennial celebration). Duncan Keith, Brent Seabrook, Patrick Kane, Jonathan Toews, and Artem Anisimov spent a couple of weeks together in December, playing 21:26 without scoring once. How does such a talent-rich group go that long without scoring in a 5v4 situation? Well, they spent most of their time teeing up Seabrook for one-timers and playing catch from circle to circle. Needless to say, this experiment didn’t last long.